The T-fal P25 6.3QT Stainless Steel Pressure Cooker by T-fal is a stainless steel pressure cooker that includes a steamer basket. The impact bonded base is made of 3-ply stainless steel and works with either gas, electric, ceramic or induction cook tops. The interior is satin finished and the exterior of polished stainless steel. It has a variable control operating valve with an over pressure gasket release window and has an automatic safety controlled system for easy opening and closing. The T-fal P25 6.3QT Steel Pressure cooker has 2 cook settings of high and low and comes with a steamer basket for steaming vegetables. It is dishwasher safe and includes a handy recipe booklet. Consumers using the T-fal P25 6.3QT Stainless Steel Pressure Cooker have given it a five star rating for satisfaction and excellent quality. Most customers had one thing in common in choosing this pressure cooker. It is made of stainless steel rather than aluminum as some cookers thus eliminating the leeching of metal into the foods. To the more health conscious, stainless steel cooking products are preferred. This pressure cooker is said to cook very quickly and quietly. Consumers love the choice of the 2 cook setting offered and the fact that they have to use little to no liquid in the cooking process. Both time and energy are saved using this pressure cooker. Several buyers are fans of T-fal and aware of the high quality of workmanship they produce. Having owned several other products produced by T-fal they said choosing this pressure cooker was a no-brainer for them. They loved the reasonable price as well as the safety features of the T-fal 6.3QT Steel Pressure Cooker. 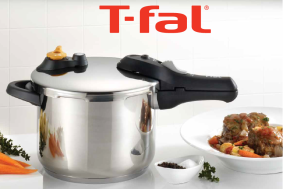 The T-fal P25 6.3QT Pressure Cooker also has a very thick bottom base that keeps food from burning or sticking. Very little water is needed to cook food to perfection. The color and design is very modern and unlike most other pressure cookers in visual appeal. 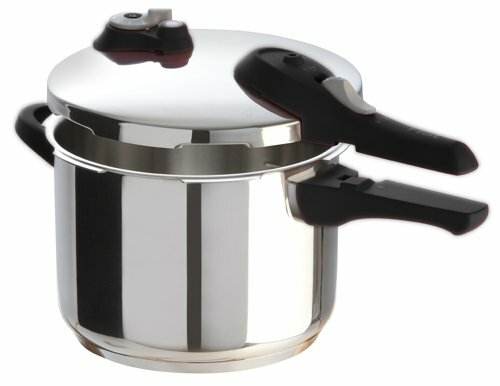 One review we found mentions the fact that this pressure cooker only reaches 12 PSI of pressure whereas most other pressure cookers reach 15 PSI. It was said that this would require additional cooking times for most food. 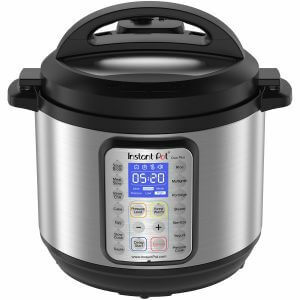 We found that other reviews stated that the cooking times were extremely fast and this confirmation came from those who had experience using other pressure cookers. It is in our opinion that the T-fal P25 Pressure Cooker is as comparable in efficiency as the higher rated PSI cookers. We would feel very comfortable in recommending the T-fal P25 6.3QT Pressure Cooker to anyone searching for an excellent cooker.